The ebook pricing model is going through an interesting time with Apple trying to talk to publisher (both small and big) to go for agency model (which means 70% for publisher & 30% for retailer split) and get an assurance that they will not sell the same book at a lower price through any other retailer (read Amazon). Amazon on the other hand has made it clear that it is not going to sign Agency model deal with any one except the Top 5 Apple publishers. This has left Publishers in a dilemma.If they go for Agency model with Apple they will not be able to sell through Amazon because Apple deal will not allow them to sell the same ebook at a lower price anywhere else and if they do not sell through Apple then they are increasing the power of Amazon even more. 2. or Amazon is fine with Publishers doing Agency agreement for ebooks sales. Next few months are going to be really interesting as Amazon will try its best to use its clout in print books to arm twist mid and small publishers in staying away from Agency model and Apple will try its best to make its ebook offering best by having as many publishers in the program as possible. The third big player in this game is Google. It will interesting to see which way will Google go with its Google Editions offering. American Editor recently ran a poll to figure out what stops users from buying an ebook. The results are out and no surprises. 2. 26% of the publishers think that pricing of ebooks above $9.99 is detrimental in them buying an ebook. This seems to support the argument given in a recent NYT article about ebook pricing which was condemned by publishers. 3. 8% of the respondednt think that price greater than $4.99 is an issue. Clearly, the sweet spot for ebooks lies somewhere between $ 3.99 and $9.99. Now its upto publishers, Google, Apple and Amazon to use their brain power to figure out what price they want to support. 2010 is going to see a multitude of new eBook devices being launched, lots of user feedback, experimentation and plenty of uncertainty over which platform to choose for the eReader device. But in order to plan and benefit from onslaught of new devices publishers needs to keep thier eye on 3 areas: distribution, design and revenue. 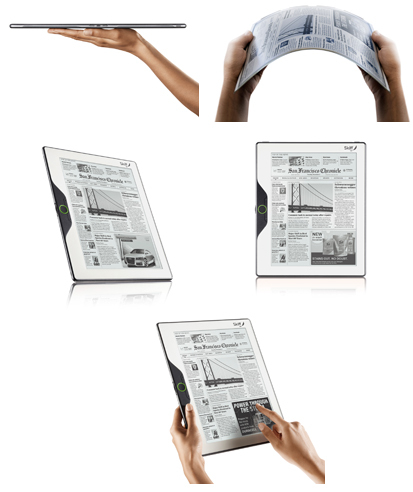 Another key component for a good distribution strategy is to figure out the timing of digital edition vs print edition. Early accesibility to content is what user would love to get and this could be a big selling point for digital magazines, newspapers. In order to come up with a winning strategy around digital publication, device makers and publishers will need a lot of input from the actual users of the product. As ink technologies get better, publishers will have an opportunity to create interactive and highly engaging publications (of course they might have to invest some resources in understanding how customers are using these ereaders and what are their expectations from digital publication. There are few issues with the existing digital subscription model (as enabled by the ereader) – type of subscription (daily? monthly? annual? ), revenue sharing system between distributor and content creator. Moreover publishers have already given Amazon as much as 70% of the subscription revenue that is coming through the Kindle store. Publishers need to encash upon a couple of opportunities here: Device makers wanting to loop in bigger names will be more open to a more balanced(healthy) revenue share. Skiff (publisher-led innitiatives) is likely to give more subscription revenue into the content providers’ hands. Although every other book retailer and/or consumer electronics company are entering into the highly competitive and most talked about eBook industry with e-Reader devises such as Skiff, Nook, EnTourage’s eDGe the big question here is what will truly revolutionize the eBook industry. Is it the cool, super innovative devices or the eReader platforms that is going to decide the fate of the big players and innovation in the eBook industry? Blio will be offering publishers the opportunity to create digital files at no cost that can pretty much preserve the format of previously tough-to-digitize tomes such as cookbooks. So would it be right to think that while Amazon might land up with greater ebook sales than pbook sales (on Christmas Day) and while publishers can feel good about spreading the wealth around to other readers these new platforms may hold the key to larger market share and review ultimately which would land up making a difference in their bottom line?